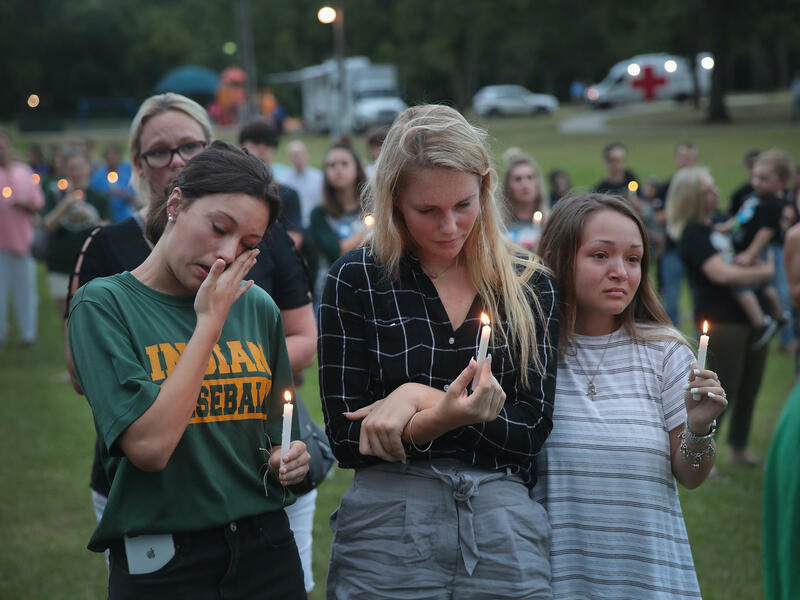 Mourners attend a prayer vigil to remember the victims of the Santa Fe High School shooting on Sunday in nearby League City, Texas. On Friday, a student allegedly entered the school with two guns and opened fire, killing 10 people. The public schools in Santa Fe, Texas, are closed Monday and Tuesday, as the community mourns and grapples with how to put the pieces back together. The alleged shooter, a 17-year-old student at the school, has been charged with capital murder and aggravated assault. On Sunday, the first of the funerals took place. Pakistani exchange student Sabika Sheikh, 17, was remembered in a service at a mosque in suburban Houston, before her body is returned to her family in Karachi, The Associated Press reports. "Even through her death, she will continue to be a diplomat. Even in her death, she is pulling the relationships between Pakistan and the United States, specifically the Houston area, even closer," said Houston Mayor Sylvester Turner, according to USA Today. "I'm almost to the point where you almost become speechless because these incidents are happening way too much," Turner added. "The best way we can honor Sabika is to take preventable steps to try and mitigate this from happening again." Houston Police Chief Art Acevedo has been pointed in his response to the violence in nearby Santa Fe. "This isn't a time for prayers, and study and Inaction, it's a time for prayers, action and the asking of God's forgiveness for our inaction (especially the elected officials that ran to the cameras today, acted in a solemn manner, called for prayers, and will once again do absolutely nothing)," he wrote in a Facebook post on Friday. "We need to have a national background check system that is uniformed with real teeth and real consequences for those that try to defeat it in trying to get guns and for those that sell guns to the wrong people," Acevedo told NPR's Lulu Garcia-Navarro. "We need to take pragmatic action to keep guns in the right hands. I tell you what we all need to do is to stop throwing our hands up. This is the American people. We are a can-do people. We're a can-do country. And we can put a man on the moon and aircraft on Mars. We certainly can address the gun violence which is really a public health epidemic in this nation." Texas Lt. Gov. Dan Patrick doesn't agree that guns are the problem, instead citing violent video games and abortions. "We have 50 million abortions," he told CNN on Sunday. "We have families that are broken apart, no fathers at home. We have incredible heinous violence as a [video] game, two hours a day in front of their eyes. And we stand here and we wonder why this happens to certain students." Students at Santa Fe High School had different opinions on whether the alleged shooter was a normal, friendly kid. A fellow football player said he'd been joking around with the suspect just the day before on a field trip, while another classmate described him as "really strange and quiet" and says she wasn't surprised that he was the one who allegedly carried out the attack. The mother of Shana Fisher, one of the victims, believes her daughter was specifically targeted. "He kept making advances on her and she repeatedly told him no," Sadie Rodriguez told the AP. "He continued to get more aggressive." She said her daughter had "stood up to him" the week before the shooting, but did not give further detail. Meanwhile, students around the country used a hashtag to respond to the Santa Fe High shooting and to advocate for gun control. "#IfIdieInASchoolShooting politicize my death. It's not too soon to talk about guns. It's too late," wrote Sofie Whitney, a senior at Marjory Stoneman Douglas High School in Parkland, Fla., where a student killed 17 people in February. Zion Kelly is a high school student in Washington, D.C., whose twin brother was killed in an attempted mugging in September. "#IfIdieInASchoolShooting or any shooting, I want to be buried right next to my brother," he wrote.